Why some of the most artistic and creative people in history have had difficulties in reading was explained in the book The Gift of Dyslexia, by Ron Davis. In his book, Ron (a dyslexic) relates his own schooling difficulties. He became an engineer, artist, and businessman without reading a book. He explains how he discovered the way his thought processes of "three-dimensional picture thinking" differed from the "linear word thinking" experienced by the majority of people. Upon discovering the differences in thinking styles, Ron set about determining how to address the differences to make communication using two-dimensional symbols (written letters and words) less frustrating for 3-D thinkers. Davis Dyslexia Correction® is the result. The actual meaning of the word Dyslexia is bad (or problem) speech (or words.) It is used in our culture to label a problem with reading, writing, and, occasionally, mathematics. In fact, handwriting problems should be labeled dysgraphia, and mathematics difficulties labeled dyscalculia. All three of these blocks to success can be addressed and corrected through Davis Dyslexia Correction techniques. "Dyslexics---three-dimensional thinkers---see a moving picture as they imagine things or understand them. People who don’t think in pictures are called linear, word thinkers. Linear thinkers must put concept on concept and describe word by word. Imagine how many words and how difficult it would be to describe a peacock to someone who was unfamiliar with peacocks. 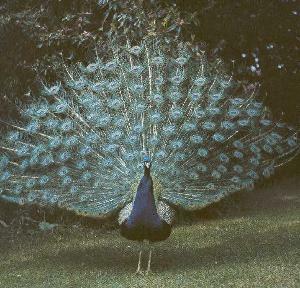 "They say a picture is worth a thousand words---now imagine how much faster and more complete the concept of peacock is grasped if you show a movie of a peacock unfurling its unique tail. This explains why those who are described as genius by us are also understood to be multi-dimensional thinkers. Their thinking and understanding is faster and more complete than linear thinkers!" Ron Davis, founder of the Davis Dyslexia Correction Program® and a dyslexic himself, believes dyslexia is a result of an inherent mental gift or talent. People who develop dyslexia think in pictures, rather than words: they are imaginative and creative and try to solve problems by looking at the whole picture, rather than working step-by-step. Due to their picturing things in multi-dimension, dyslexics have difficulty learning to work with two-dimensional symbols such as letters or numbers. When confronted with confusion, dyslexics may try to solve their confusion by multi-dimensionalizing the word or letters and mentally "traveling around" the symbol to understand it. Because of the two-dimensional nature of symbols, this increases, rather than decreases the confusion as letters are reversed and perception altered. Traditional education has not understood this mode of thinking and has labeled dyslexics as learning disabled when, in fact, it is the current system which is unable to address this unique way of thinking. The dyslexic is perfectly capable of learning---faster and more completely---if the material is presented in a manner which addresses multi-dimensional thinking. If dyslexics are unable (or disabled) to learn, what accounts for these dyslexics’ success?